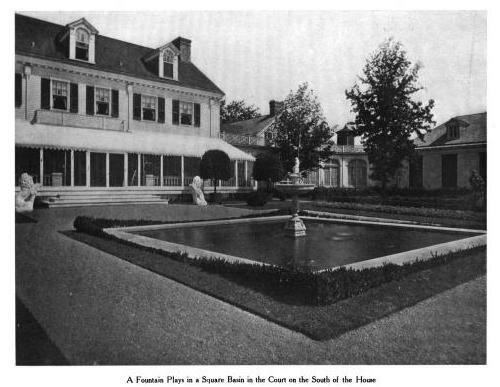 'Deepdale', the William K. Vanderbilt Jr. estate designed by Horace Trumbauer c. 1902 in Great Neck. These pictures show the house before the Carrere & Hastings alterations which can be seen in the sale brochure HERE. Click HERE for more on 'Deepdale'. Click HERE to see 'Deepdale' on google earth and HERE on bing. 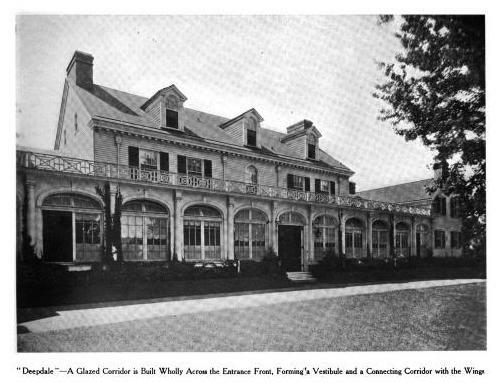 Pictures from American Homes & Gardens, 1906. What an odd and un-Trumbaueresque house. It's hard to believe that it was all conceived and built in one go. Even the gardens seem out of scale and out of character with the almost Colonial main block of the house. And where did those wings and "glazed corridor" at the entrance front come from? They look to me like an awkward attempt to solve for something, which clearly would not be the case if Trumbauer was designing "from scratch". Much improved by the Carrere and Hastings alterations, to my mind at least. Is Deepdale a private residence once again? Anon: No, it's the clubhouse for a very swish private golf club of the same name. There was a big "to do" several years ago when the town fathers threatened to condemn it for use as a municipal course. There was a justifiable outcry against the attempted use of the government's right of emminent domain for such a purpose, and plans were dropped. I agree with Magnus about this not looking like Trumbauer’s work at all; it makes you wonder what Virginia [Graham Fair] & William K. Vanderbilt Jr. told Trumbauer they wanted in 1902 … & what they actually wanted. Zach, how long it was until Carrere & Hastings were brought in to enlarge the house (which, of course, was then reduced in size in 1931) & make it not look like, as Magnus said, “an awkward attempt to solve for something”? Magnus, I’m sure you’re correct but looking at the Bing view it’s difficult to see how this house is the clubhouse for a golf club – I assume you mean the nearby Lake Success Golf Club? I wish I belonged to the Lake Success Golf Club … I’m sure nothing bad ever happens to any of its members. The more I look at these photos, the more I wonder: There was a huge Colonial Revival movement in the early years of the last century. When WK, Jr. bought Deepdale, was there a Colonial Farmhouse on the property? 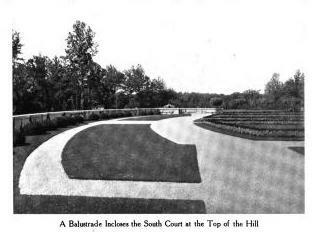 And was Trumbauer given the unenviable task of building around the relatively modest structure to incorporate the ballrooms, billiard rooms, guest rooms servants' rooms and labyrinth of service rooms that a Vanderbilt of that era would have required? Oh, I think Trumbauer had plenty of bad days---some of his earlier stuff is just awkward and heavy----the real design sleekness coincides almost exactly with Julian Abele joining the firm---which makes sense---Abele's Beaux arts training and first hand knowledge helped give Trumbauer's natural instincts form and editing. And yes indeedy, Deepdale is an odd place----those glazed corridors put this reader to mind of a sanitarium. I remember, somewhere, years ago, seeing a photo of a Deepdale interior when the WKVs Junior were early in occupancy. It was pure Elsie de Wolfe style French, its relative opulence at complete odds with the exterior, also with ceilings too low. I was comparing the “When ‘Deepdale’ Was For Sale” brochure to the Bing views & realized the entrance & back sides of this house have been flipped. If I’m looking at this correctly the original front door faced Lake Success & had the Palladian window over it (which is now on the back side of the house) while the garden side was given the columned portico in the Carrere & Hastings remodel & now appears to be the entrance side. It probably doesn’t matter much to the function of the house & I suspect was a by-product of subdividing the property & losing the lake view. At least the house still stands. Some interiors will come tomorrow. Magnus...I'm not entirely sure...will check when I get home. Deepdale Golf's current clubhouse was W.R Grace's house. Original Deepdale Club is now Lake Success Club. As I recall, the Vanderbilt complex known as Deepdale resembled the layout of Wheatley somewhat, with its galleries & enclosed courtyard. 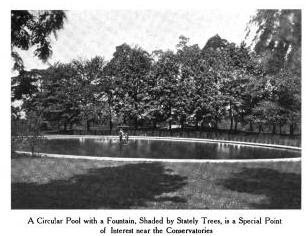 At the time of construction, it apparently had an enviable vista of Lake Success, too. Security word - gahsphs: the German audiences' initial response to the premier of Lohengrin. LGB- do you write a blog? If not, you should! LGB....do you have Lynnewood Hall in your database? New photo links for "Deepdale"
Zach...nothing to do with OLD LONG ISLAND...but with your NEW YORK site...do you know what mansion this could be from the movie "Godspell"? Sorry go to 4:40...that'll take you to the mansion I'm talking about. Anon 10:44pm – the mansion used for the ‘Godspell’ clip you linked to is the Andrew Carnegie mansion at 2 East 91st street in NYC. The building is now the Cooper-Hewitt, National Design Museum; see http://www.cooperhewitt.org/; it is open for tours. My name isn't Zach, but since I happen to recognize it, I'll raise my hand. It's the Andrew Carnegie mansion, now the Cooper-Hewitt Museum, on E. 91st & Fifth. well, DED, if that's a sanitorium, commit me. I like those long snaky wings - plenty of room to roam around in unlike now where that poor place is so hemmed in if somebody sneezes, 300 people say Gesundheit. this is one of those houses that i'm glad it survived but they should have put it somewhere else or sold two less house lots around it. another example of architects doing their best work after they were long dead i.e. one of HPHS writeups say the "mansion was converted in 1954 by Horace Trumbauer". Maybe there is life after death at least for famous architects. security word def - "obilogr" - wan kenobe's brother who worked in the North woods with Paul Bunyan. "mansion was converted in 1954 by Horace Trumbauer". That can't be right. Which one? HPHS where is that quote from? SPLIA and Spinzia both credit the original Deepdale to Trumbauer c. 1902. The quote was from TPR. "another example of architects doing their best work after they were long dead i.e. one of HPHS writeups say the "mansion was converted in 1954 by Horace Trumbauer". Maybe there is life after death at least for famous architects." My question was which tag/property? He wasn't referring to Deepdale. Thank you DFP and DED. I remember reading an article written when William K. Vanderbilt was in the beginning stages of building Deepdale-the estate. The house that became the mansion was originally built to house his grounds manager. Willie K. was undecided where to place his mansion, when he realized the best location was already occupied. The original house was then expanded upon rather than razed, probably because it was recently built and Willie K. seemed to be having cash flow problems. I'll try to find the article again. Yes .... the actual main house without the former wings is and has been a residence for some time. I have had the priveledge to be a guest of the former owners many times over the years.